Browse: Home / 2009 Football Season Review – What Goals Were Achieved? Before the season started we assembled a list of 10 attainable goals for Cyclone football in 2009. We thought it would be fun to take a look back and see how many of the goals were achieved. The Cyclones ended up achieving 6 of the 10 goals with near misses on the other four. We also need to recognize the team for two bonus achievements that were accomplished with the win at Nebraska. 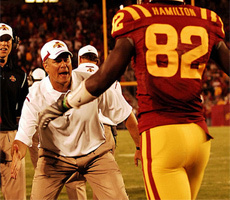 It was a great year for Paul Rhoads, his coaching staff and all of the Cyclones players. The main goal was to WIN A BOWL GAME and they did it. Congratulations on a great season!! Goal Achieved – Iowa State defeated North Dakota State 34-17 in the season opener. Goal Achieved – Iowa State defeated Baylor 24-10 in the third Big 12 conference game. 3. Win the neutral field game – We feel the game against Kansas State is the most important game of the season. 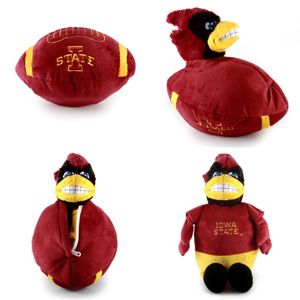 If ISU has any hopes for a bowl, this game is a must win. Cyclone fans need to go to KC to support the team, a winning streak leading in to this game would certainly help encourage fans to make the trip. Goal Missed- Iowa State dropped the game to Kansas State 24-23 when Grant Mahoney’s extra point was blocked with 32 seconds left in the game. Goal Achieved – Iowa State put an end to the dreaded road losing streak in their first opportunity with a 34-14 victory at Kent State. *Bonus* – The Cyclones also ended the 14 game Big 12 conference road losing streak with a 9-7 win at Nebraska, it was the first win in Lincoln since 1977. Goal Missed- Iowa State had a good opportunity to defeat #16 Kansas, but Austen Arnaud’s game winning pass sailed just over the outstretched arms of Darius Darks who was running wide open in the end zone. The Cyclones dropped the game 36-31. *Bonus* – When Iowa State defeated Nebraska they were out of the top 25, but the Cornhuskers finished the season as the #14 team in the nation. 6. Sweep the non conference games – Iowa State needs confidence, probably more than any team in America. Winning the first four games would go a long way to getting some swagger back. The schedule sets up nicely for a run at the beginning of the season. The most likely stumbling blocks are at home to Iowa and on the road at Kent State. Goal Missed – The Cyclones won 3 out of 4 games with the only loss coming to #7 Iowa. 7. Go .500 in the conference – Winning 50% of your conference games seems like a strange goal, but for a team that lost all of their conference games last year, winning 4 conference games would be HUGE. Winning 4 of these 5 games is the most likely scenario (Kansas State, Baylor, at Texas A&M, Colorado, at Missouri). Goal Missed- The Cyclones went 3-5 in the conference with wins over Baylor, Nebraska and Colorado. The three wins was a big improvement over zero wins in 2008. Goal Achieved – Iowa State won the four games we predicted they would above for a 4-2 record at home. Goal Achieved – The Cyclones won the six games it takes to get bowl eligible, but they got it done in a way that most wouldn’t have predicted. When Iowa State lost to K-State at Arrowhead, a bowl game seemed like a long shot. The Cyclones got that needed victory back when they went on the road and upset Nebraska without Arnaud and Robinson in the lineup. 10. 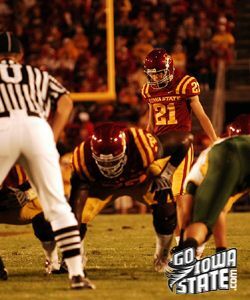 Win a bowl game – If you watched the Cyclone preseason special on FSN you learned two things. 1. FSN knows absolutely nothing about Iowa State 2. Iowa State’s main goal is to WIN A BOWL GAME this year. Iowa State’s last bowl victory was in 2004 over Miami University. A bowl victory would be a giant step in the right direction for this football program. Goal Achieved – In his first meeting with the team Paul Rhoads told the team that he was proud to be their coach and they would prepare diligently to WIN A BOWL GAME. The Cyclones achieved this goal when they defeated Minnesota 14-13 in the Insight Bowl in Phoenix.